Anyway, the point is, Kelly Leak, the coolest of all charismatic brooding loner heroes, announces early on, by being astride a motorcycle, that he comes directly from the heart of the rebellious, questing version of the American Dream. Brando in The Wild One. Hopper and Fonda in Easy Rider. Even, in decidedly tamed form, the Fonz in Happy Days. Kelly, with his flat expression and apparent outsider status, showed himself to be among those older heroes of youthful adventurousness and alienation, but to that he added an element that expanded the range of the motorcycle rebel icon: he could do stunts. The stunts furthermore showed both that he was an athlete of almost mystical powers and that he had a daring disregard for his own safety. In this way he merged a bit of the flash and spectacle of real-life 1970s motorcycle icon Evel Knievel with counterculture cool, and he also foretold a growing trend in youth sports and in the greater culture: the rise of “extreme” action sports. Which brings us to today’s card, which I found on the sidewalk a few months ago as I was hoofing it up Western Avenue to catch the Blue Line train. It appears to have come as an insert in a Sports Illustrated for Kids magazine. I doubt it somehow slipped from the grasp of a loving collector of Motocross Rider cards, because, for one thing, I doubt there are very many devoted collectors of any kind of cards anymore, and for another, any kid interested in Motocross Riders is probably more likely to want to actually do sports than to be a spectator and collector and dreamer of sports. In addition to being a spectator and collector and dreamer of sports, I always liked to play sports, too, but despite being a loner (or maybe in part because I was a loner who otherwise didn’t have much of a social life outside of sports) I preferred team sports. The only solitary sport I participated in was cross-country skiing, which I liked more than downhill skiing in large part because of my inherent cautiousness. 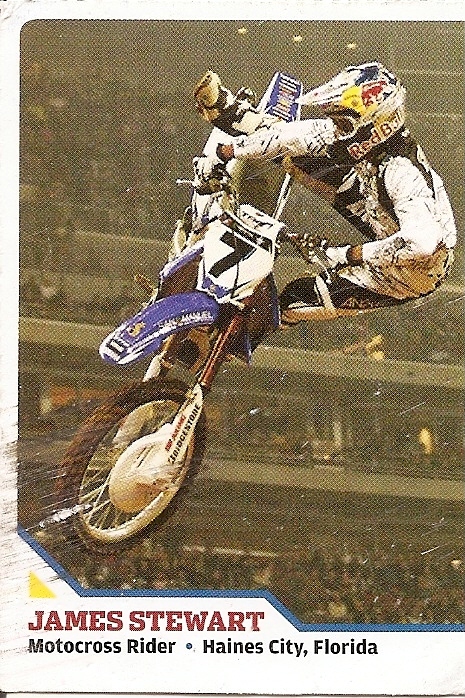 I never could have been like Kelly Leak or the “Supercross” champion shown here, James Stewart. Once, the Kelly Leak of my grade, Mike Heyder, came over to my house with his minibike, and I was too terrified of it to even try going ten feet across the soft grass of our side yard. Another brush with “action sports” came when I begged and pleaded for a birthday gift of “The Shark,” a yellow plastic skateboard in the Sears catalogue, but when I got it, after the surging thrill of holding the mysterious object in my hands and listening to the ball-bearing whir of the red rubber wheels as I spun them, I was barely able to stand on the thing for fear of flying off of it and shattering my skull. They made a remake of The Bad News Bears a few years ago, which I saw with my friend Pete, but I’ll be damned if I can remember a single thing about it beyond a sense that it was not awful and that it was utterly unnecessary. Also, I recall that it was set in the present day, which makes the involvement of a Kelly Leak character highly improbable. These days, if Kelly Leak got the urge to participate in organized sports, he could apply his talent and daring to any number of “extreme” pursuits. He could be Tony Hawk (who, I believe, loved baseball but quit it to devote himself to riding structural cousins of The Shark). He could be James Stewart, Motocross Rider. He could be the Kelly Leak that existed before the beginning of the first Bad News Bears movie, never venturing inside the confines of the little league field. I guess more athletic options for kids can’t be a bad thing, but in light of the above discussion it saddens me nonetheless. How can baseball survive the loss of Kelly Leak? I expected this to be about the running back. Had no idea they ever made motocross cards. I think Kelly Leak first appears at the start of the film lighting Walter Matheau’s cigar with a 4″ flame on his cigarette lighter. Then I think Joyce Van Patten yells at him and he takes off on his motorcycle. Kelly Leak was mix of Mickey Mantle, Evel Knieval, Fonzie (Pre Shark-Jump), James Dean, and Marlon Brando’s character in the Wild Ones. The “Kelly Leak as Pitcher” is excellent point which I never thought of before. I guess they wanted to center the film around Tatum O’neil’s Feminist pitcher character Amanda and Matheau’s alcoholic ex-pitcher father figure. I guess the Amanda-pitcher/Buttermaker-pitcher dynamic wouldn’t be as strong if added a “Leak/pitcher” dynamic into the mix. Kelly Leak was kind of unique character compared to real life Little League because he was Heroic/Outlaw/Loner character. Most kids that resembled Kelly Leak: (BMX, cigarette, tough kid) weren’t Heroic figures or Loners. For the most part they were just outlaws that were “Bullies” and would just ride their BMX bicycles in a posse and prey on smaller and weaker kids. And then they usually quit baseball by 12 or 13 saying it was “gay”. I went to Catholic school with a Rich kid who wasn’t an outlaw but kind of a Heroic/Loner who rarely mixed with other kids but was big/strong and an excellent athelete. He was a left handed pitcher who would strike out 9 kids in a 6 inning game. He quit baseball at 12years old after making the “All Stars”. He really could care less about baseball and said it “wasn’t challenging” anymore instead he wanted to concentrate on Golf. Hey, was that Bonham card a last minute dealy with the cap painted on? That would explain the fact that he was a longhaired Red. I think it’s exactly what happened. It’s a pretty decent doctoring job, so you don’t notice it right away. Check the comment in that post from me that pastes in an email from a reader who is able to identify the background of Bonham’s card as the Cubs spring training facility. I can think of some kids in my town who resembled Kelly (like the minibike owner I mention in this post, for starters), but yeah, Kelly was mythic. Funny story about the big tough loner quitting baseball for golf. The Kelly Leak of my neighborhood was also the first kid my age I knew who died. He’d moved away by then, but friends said he was riding his motorbike too fast, crashed into a roadside ditch and died there before anyone found him. The Big-Tough/Loner/Golf kid was an interseting person from my school. He was the youngest out of 7 or 8 kids with 5 older brothers. He was a terrific athelete Football/Basketball/Baseball, overall he was the best athelete in our class. He was a fairly smart kid but he was definitely kind of an eccentric. He didn’t live in our town, he lived in a very small very rich town that was about 5 miles from our school. This might have played a factor in his loner persona, plus I think there was a fairly large gap in age between his brothers and himself. By 6th-8th grade he kind of became the de-facto leader of the Nerds/Geeks/Misfits/Pot-Heads/Fat-Kids/….and the 3 guys that were a hybrid: misfit/pothead/fat-kid/Football-Player all in one. Also, he was probably the only kid in the state of New Jersey that was a Kansas City Chiefs fan during the late 70’s. He even had a Chiefs Varsity Jacket!! He probably was the only kid East of Missouri that owned one of those in the late 70’s. He used to take on the entire 7th grade in a king of the hill competition in which he usually won or we needed about 4 guys to bring him down. As far as baseball went, he was a great pitcher. He was Left handed, threw fastballs. He made the All-Stars as a 12 old and basically hung it up. We were all shocked the next year when he decided he wasn’t going to play baseball anymore but he was quite emphatic saying he was going to focus on golf. The first time I saw him, I thought Tim Lincecum looked like Kelly Leak. I could have sworn Kelly Leak’s hair was longer. Somehow, this seems to fit for both this thread and the post-Bill Bonham thread…an oral history of the great cult classic teen rebellion flick, Over The Edge. Excellent point blankemon, I was thinking about bringing up “Over the Edge” during the Bill Bonham thread. Under-rated movie from the time period and another movie I would recommend to anyone along with “Bears, Smile” To understand what growing-up in the 70’s was like. I can remember watching “Over the Edge” during the winter of 79-80 on HBO when I was about 13 and it hit me like a ton of bricks. That was another movie that didn’t talk down to kids and actually tried to depict them in an honest way. Another film with a similar feel from the time period was “Foxes” starring Jodi Foster.